Fly tying in Maryland? Please join us for a Beginners Fly Tying Class on Saturday, January 24, 2009 from 9:00 AM till 12:00PM. 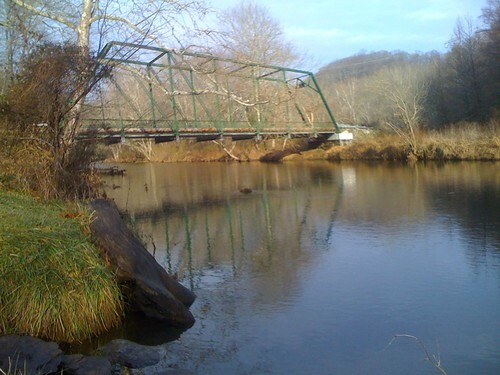 It’s an introductory fly tying class that focuses on Gunpowder river streamer patterns. One of our Maryland river guides will be teaching this fun-filled beginners class. Cost of the class is $45 per person, and includes the use of tools and materials. The class is limited to six and pre-registration is required. Please give us a call at 410-357-9557 or drop us a line at info@backwaterangler.com to pre-register. 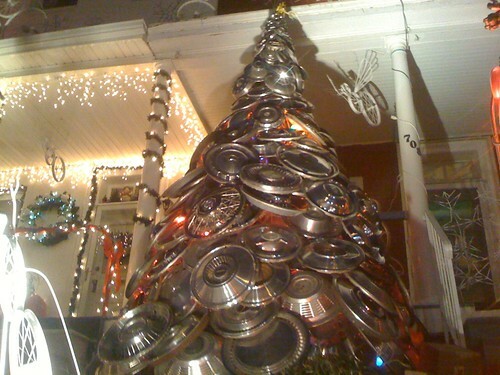 This entry was posted in events on December 29, 2008 by Theaux Le Gardeur. So… if you’re planning on picking up a fishing license to ring in the first fishing day of the New Year, please do so at the shop before Thursday, January 1st, 2009. We’re open from 10AM till 6PM through the week. We will be open New Years eve till 4PM. Resolve to fish more in 09′. This entry was posted in news on December 28, 2008 by Theaux Le Gardeur. Glad I stopped by the shop last Sunday, always fun hanging out in the warmth of the new digs after a morning of cold fishing. Well, the day was productive. The water was moving fast on the GP, so I decided to head over to the Little Falls and some of its tribs. Managed a few nice browns and this big boy. Who says our streams don’t have big browns?! Caught on a double-bead pheasant tail (#12) – seems like a big nymph, but it was my weighed fly (lost my dropper and didn’t feel like tying another one on). Released safely for another day. This entry was posted in fishing report on December 26, 2008 by Theaux Le Gardeur. The Gunpowder river has been flowing in the mid 100’s this week. While it has been dropping a bit, (the latest gauge reading is showing 102 CFs), “icing effects,” (please see our related post from 2004 below for a primer) may be showing slightly lower flows than actual stream conditions. Today the Gunpowder river is clear and chilly at 47 F. We have nearly ideal Winter conditions along the river for fishing streamers and nymphs. It so happens that we have just put out three new trays of bright, flashy streamers for your approval. 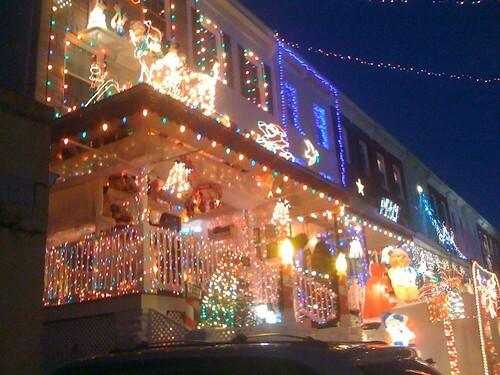 After getting some fishing time in, be sure to check out the lights in Hamden on 34th St.
For the late shoppers among you, the shop will be open Christmas eve from 10 till 3 PM. The shop will be closed Christmas day and will reopen on the 26th from 10 till 6PM. If the weather allows, bring the family members that have been “good” up to the river this weekend. The shop will be open from 8 AM till 4 PM both Saturday and Sunday. This entry was posted in news on December 24, 2008 by Theaux Le Gardeur. Fly tying in Maryland? Please join us for a Beginners Fly Tying Class on Sunday, January 18, 2009 from 9:00 AM till 12:00PM. 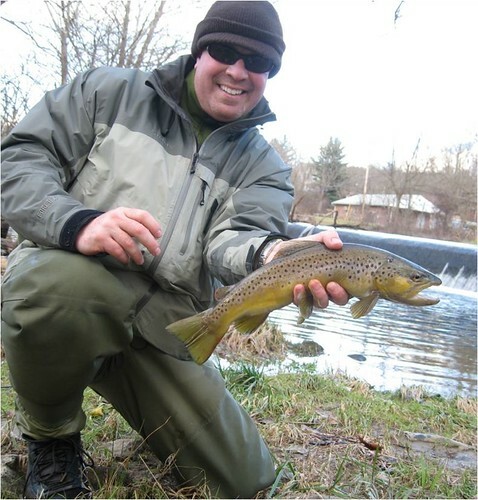 It’s an introductory fly tying class that focuses on Gunpowder river fly patterns. One of our Maryland river guides will be teaching this fun-filled beginners class. Cost of the class is $45 per person, and includes the use of tools and materials. The class is limited to six and pre-registration is required. Please give us a call at 410-357-9557 or drop us a line at info@backwaterangler.com to pre-register. This entry was posted in events, news on December 22, 2008 by Theaux Le Gardeur. Rain, sleet, snow and wind are just a few of the weather conditions anglers have dealt with on the Gunpowder the past few weeks. The great water levels brought many anglers by the shop to restock on flies, and to load up on materials for days when the weather gets real nasty. Recent orders have filled the walls with plenty of materials to keep tying interesting at the vise this Winter. 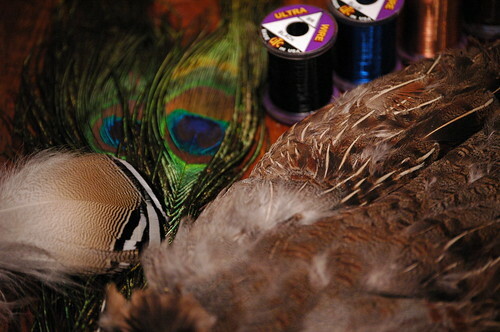 Threads, beads, hooks, flashy synthetics, furs, dubbing and feathers in a variety of colors can help put together a pattern that will produce this week or next Spring. Stop in and see the expanding selection of totally new materials, as well as great gear from Filson, Simms, Patagonia, Chota, Fishpond, Cloudveil, and rods from Scott, St. Croix and Winston. This entry was posted in news on December 21, 2008 by Jason du Pont. 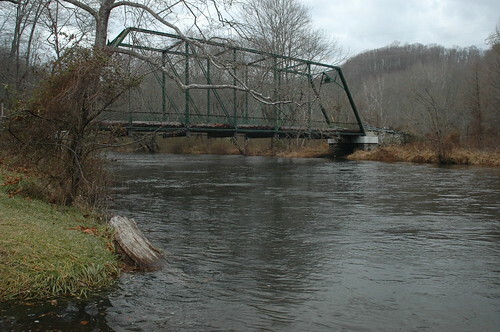 The Gunpowder river is flowing at 126 Cfs, is in the mid 40’s (F) and is clear. Recent reports point to excellent Winter fishing and very little pressure along the stream. Small nymphs in the #16-20 range have been most effective in riffles and flats from Falls Rd through Bunkerhill Rd. Try streamers a little further downstream to Bluemount. Make sure you bring along your rain jacket and feel free to stop in the shop while you’re up. Today we’re checking in some great Insulated Filson Packer Hats, Patagonia Sticky Wading Shoes and Patagonia Regulator Flash Pullovers. Thanks to Gunpowder River Guide Capt. Jeff Lewatowski for the following stream report. I thought I would give you a quick report in writing of my 3 hours of fishing on Wednesday afternoon. I fished the late morning from Masemore downstream, water flows were 160, air temps in the high 40’s. The forecast was for light rain, but I was amazed to pull into the lot, the only vehicle there. In the course of fishing the first two riffle run combos downstream, I landed 8 browns, the best 12 inches. I fished a basic dropper nymph rig with a pair of red butts in a 16 , sometimes switching out to the “secret weapon” a size 16 bead head pheasant tail (yes, it is that easy). I continued downstream fishing the nymph rig, switching out to a streamer a few times after setting the hook on bottom and ending up in the trees. I managed a nice footlong rainbow on a zonker, and two browns in the flat water on the way to Bunker Hill Rd. Caught my best fish about 13 inches on the way back, and stung a big fish in the riffle above the hemlock bend who managed to shake me off. Point of the report, I never saw a soul. This has been the case more often than not on my recent guided trips, and outings for fun throughout the river. I am ever amazed that more folks are not taking advantage of the good stream flows and unique fishing we are so lucky to have here on the Gunpowder. This entry was posted in news on December 19, 2008 by Theaux Le Gardeur. 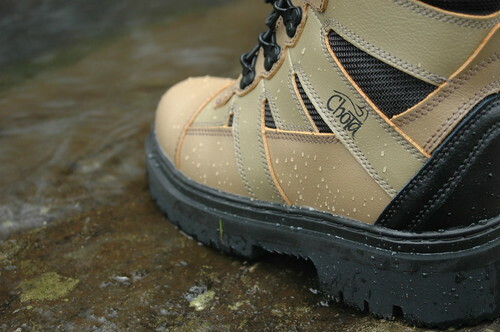 Chota’s newest wading boot, the Rock Loc boot, is the latest rubber soled model to hit the market. Since the rubber soles have become popular, I’ve tested a pair from about every major manufacturer that has arrived at the shop. Before I hit the river in these I wanted to ask Mark at Chota how they settled on this design. Mark relayed to me a lengthly process of testing, over a year’s time, before they got the shoe just right. Guides and anglers from different parts of the country put in over 200 days each in these boots and the rubber compound/design changed numerous times based on performance. The final product is a high dirometer rubber (sticky) sole offering grip and the ability to be studded or unstudded. The leather portion of the boot is coated with a PVC finish for added durability and limits absorption. I tested them in the Gunpowder’s 175 Cfs strong flows in an area with a lot of big rocks, uneven bottom and muddy banks. The Rock Loc boot’s sole has unique features like the raised rubber tread design where the studs screw in and the bumps and ridges on the outer edge of the sole. 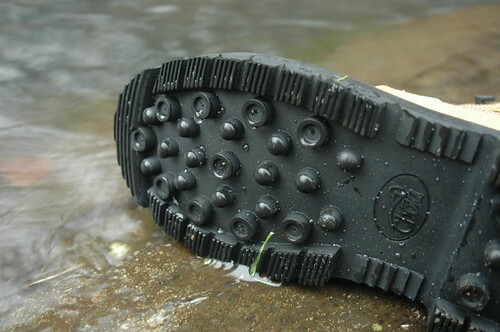 I wore them unstudded and had great traction on the river bottom, muddy banks and the wet rocks along the shoreline. All the different surface features on the sole made it possible to grip rocks of any shape. Using studs with the new raised sole design will also increase grip as the studs will stick out farther than soles where the stud sits flush to the sole.The boot is stiffer than the STL+, and, since the leather is coated, mud, leaves and dirt rinse off easily. The boots retail at $139.95 and are in stock at Backwater Angler . This entry was posted in gear, reviews on December 17, 2008 by Jason du Pont. 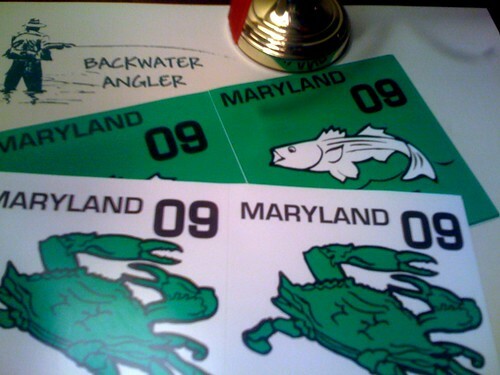 That’s right folks, we have the new 2009 fishing licenses here at Backwater Angler. Pictured above is the 09′ Crabbing sticker and Bay Pleasure Boat sticker. We sell both resident and non-resident fishing licenses as a license agent for Maryland’s Department of Natural Resources. This entry was posted in news on December 16, 2008 by Theaux Le Gardeur. This is what the Gunpowder river at Masemore Rd access looked like on Friday morning at 687 CFs. This morning it is an “ideal level” at 132 CFS, is clear and 49 F. Through the weekend Gunpowder regulars took advantadge of the dropping water levels on Saturday and Sunday and tried their luck fishing heavy streamers and nymphs as the river leveled out. The Gunpowder river looks like this today. BWO’s have been coming off most afternoons between 2:00 and 4:00 PM, until then, try small traditional streamers on a dead drift under an indicator along cut banks and nymph the riffles and flats with Pheasant tails in the #16-18 range. This entry was posted in fishing report on December 15, 2008 by Theaux Le Gardeur.